SYNTHESIS : To solution of 0.5 g harmaline hydrochloride dihydrate in 8 mL ethanol containing 8 mL concentrated HCl there is added a solution of 0.25 mL concentrated HNO3 in 7 mL ethanol. This was heated on the steam bath until an exothermic reaction set in, with considerable bubbling. Heating was continued for 0.5 min, and then the reaction mixture was cooled, producing a crop of fine crystals, which were removed by filtration and washed lightly with ethanol. With air drying, there was thus obtained 0.31 g (67%) harmine hydrochloride monohydrate which was dissolved in 3.1 mL H2O and neutralized with a few drops of concentrated NH4OH. There separated a fine, pale cream solid that was removed by filtration and air dried, to give 0.22 g (89%) harmine base as an off-white powder. MS (in m/z): parent ion 212 (100%); 169 (67%); 197 (24%), IR (in cm-1): 819, 951, 1037, 1110, 1138, 1165. Harmine hydrochloride hydrate, IR (in cm-1): 737, 800, 821, 1021, 1076, 1110, 1138, 1162. (with 25-75 mg, s.c.) L. Lewin found this to produce euphoria which Turner et al. insisted should not be regarded as a hallucinogenic reaction. (with 35 mg, orally, and separately intranasally) "In neither occasion was a notable psychoactive or somatic effect felt, and harmine could not be detected in any of the plasma samples." (with 35-40 mg, i.v.) "The most frequent symptoms were bradychardia, trouble in focusing the eyes, tingling, hypotension, cold extremities and light-headedness. All symptoms disappeared within 45 minutes after the injection except bradychardia in two subjects and drowsiness in three subjects." (with 40 mg, orally) "There was an immediate sensation of excitement with difficulty remaining in one place. Restlessness was the predominant symptom. All activity was performed as if with greater ease, and no clouding of the senses was described. It appeared to be a consequence of 'central cotico-motorstimulation'. I felt as if consciousness was packed with ether. When lying on a sofa, the lightness increased to a feeling of a fleeting sensation, and the weight of the body was subjectively less." (with >40 mg, orally) "The excitement I felt was increased even in a belligerent way. Although it is not my nature, I started a fight with a man in the street where I was the one who attacked. Even though according to the circumstances the prospect for me was unfavorable." (with 140 mg, orally) "There was no stimulation, no suggestion of entheogenic response, perhaps a little bit of sedation which was still evident several hours later. It was sufficiently mild as to make me forget I had ingested anything." (with 150-200 mg, i.v. [clinical distillation of Pennes and Hoch]) "With this route, 5 of 11 subjects reported visual hallucinations of varying degrees of complexity and organization. Bradycardia and hypotension occurred with all doses of intravenous harmine despite a 20 to 30 minute injection time, thereby limiting maximum dosage to 300.0 mg. Recovery occurred in about 30 minutes. The drug was hallucinogenic by oral or subcutaneous routes." (with 300 mg, sublingually) "I found myself pleasantly relaxed and withdrawn from my environment. There was a slightly diminished capacity to concentrate." (with 300-400 mg, orally [undocumented claim by Clarke]) "Produces psychotic symptoms." (with 750 mg, sublingually) "Dizziness, nausea and ataxia were the neurological symptoms observed. I do not choose to go any higher -- there must be other substances that are responsible for the hallucinogenic effects of Ayahuasca." (with up to 900 mg, orally [clinical distillation of Pennes and Hoch]) "Visual hallucinations might have occurred." EXTENSIONS AND COMMENTARY : Here I am being just a bit nasty. What a hodge-podge of published reports which are, in several cases, simply quoted here from the literature. Up the nose, down the throat, under the tongue, in the arm. Claims of irrational aggression at about 30 milligrams can be contrasted with claims of virtually nothing happening at all at up to a gram. I have no choice but to give the dosage as "unknown" and to let the reader pick and choose what fits his fancy. One of the most dramatic syntheses of chemistry with medicine can be found in a viewing of the treatment of the symptoms of Parkinson's Disease. The clinical course of PD had been well characterized by the turn of the century. One of the more bizarre aspects of the syndrome is the alternation of periods of total immobility with those of easy movement. To the extent that these changes might be part of willful action, it was suspected by some physicians that the disease might have psychological components, and be kind of neurosis. This led to the exploring of a number of psychotropic agents in the search for therapies. It was Louis Lewin, of Phantastica fame, who first suggested that banisterine might be useful in the treatment of disease of the nervous system. And it was Kurt Beringer, of der Meskalinrausch fame, who ran the first clinical study using banisterine on 15 patients with postencephalitic parkinsonism, in 1928. Other studies reinforced the virtues of this drug. Initially, doses of 20 or 40 mg were administered intramuscularly, and within 15 minutes the patients had less motor rigidity and were able to move more freely. Even when used orally, at 10 mg thrice daily, the responses were remarkable. In some cases the tremor was diminished, and in others it was exaggerated, but in general the mental status of the patients was brightened, without producing "psychic" effects. Banisterine became the wonder drug of the year, the feature stuff of the Sunday Supplements. Then, through a series of events, it fell out of favor just as rapidly. A large study involved patients who had been controlled rather well with scopolamine. They were withdrawn from treatment for a week, deteriorated rather badly, and to a large measure failed to respond to banisterine. And at about this time another researcher, a German physician Dr. Halpern, involved herself in self-experimentation (the physician of the 40 and >40 milligram quote above) and published these findings at the time of this excitement. Belligerency is not necessarily a good property for a drug to have in the treatment of sick people. Then it became popularized that banisterine is really an old and well known plant product called harmine. The pharmaceutical industry was evolving into the study of synthetic materials that were patentable, and losing interest in natural products that were not patentable. What a short but fascinating bit of medical history. There is a strange overlap between the chemistry of harmine and that of a botched synthesis of a meperidine analogue. During the illicit synthesis of what was called the reverse ester of meperidine, the propionate esterification of 4-phenyl-4-hydroxy-N-methylpiperidine, dehydration occurred instead, producing a compound called 4-phenyl-N-methyl-1,2,3-6-tetrahydropyridine, or MPTP. This wrong product was injected as if it were meperidine, and produced immediate and irreversible Parkinsonism in the user. What happens in the brain is that the material is aromatized to form a quaternary salt, called MPP+, a toxic metabolite. If a N-methyl bridge were to be put between the two rings of MPP+, one would have a carboline, one that could in theory be produced from harmine. This material, 2,N-dimethylharmine has been synthesized, and vies with MPP+ as a neurotoxin. What is it we can't see, here? 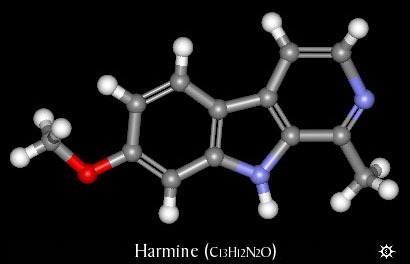 Harmine can serve as a treatment for Parkinson's disease, and a dimethylated harmine can be a potential causative agent for Parkinson's disease. As with harmaline, a number of drug combinations have been studied using harmine as the potential deaminase inhibitor. This is, after all, much closer to the basic structure of ayahuasca, where the plant Banisteriopsis caapi is the native inhibitory component, and it contains much more harmine than harmaline. In measured experiments, the use of harmine in the 140 to 190 milligram range, administered with 35 to 40 milligrams DMT, produced unmistakable effects lasting from one to three hours. Trials with smaller amounts, with 120 to 140 milligrams of harmine and 30 milligrams of DMT produced no signs of central activity at all. Harmine apparently is an effective, although modest, promoter of oral activity of DMT. At least this occurs at levels where it itself is substantially without action, so here it may truly be a facilitator rather than a participant.